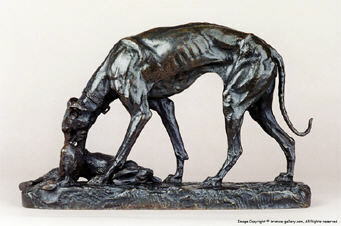 A wonderful model of a female Greyhound with a Hare she has caught, this bronze is a rare model and a fine composition. 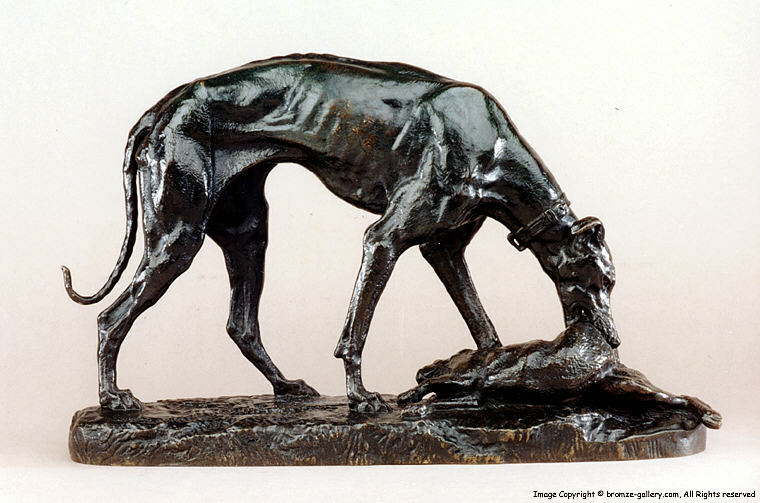 The lean structure of the Greyhound is expertly modeled and this is one of Barye's finest works. Greyhound and Hare is one of Barye's early sculptures and this cast was done by him in his own foundry sometime between 1839 and 1845 owing to the detail and quality of the cast and patina. 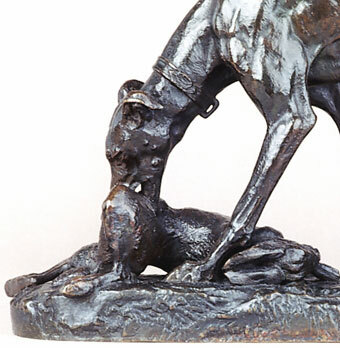 This bronze shows the dog's collar with an open ring, something that was not done on later editions of this model. The Patina is a rich dark brown with green highlights, this is indicative of the type of finish applied by Barye in his foundry. This Model is illustrated in the book The Barye Bronzes A Catalogue Raisonne by Stuart Pivar (pg. 123) and in Antoine Louis Barye Sculptor of Romantic Realism by Glenn Benge (illustration 73), and that cast is in the Walters Museum in Baltimore, MD.